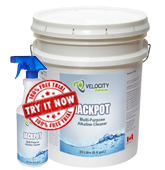 JACKPOT is a medium duty caustic liquid cleaner used to remove road film, grease, oil, carbon and pitch from machinery and exterior surfaces. Formulated to function in hard water areas. JACKPOT is used by transportation companies, mines, pulp and paper mills, engine repair shops, and maintenance shops to remove oil and grease from heavy machinery and locomotive exterior and component parts. Also, it is used for cleaning shop floors. Pre-soak – apply with low pressure at concentrations from 10-100%. Allow contact time up to 5-10 minutes depending on soil conditions and temperature. Steam Cleaning & high pressure wash – use at 0.3-1.0% at tip depending on surface soil condition and temperature. Floor and Equipment Cleaning – use at full strength to 20:1 depending on surface dirt and temperature.